One of the benefits of central planning and Singapore’s favourite tagline of being a garden city, is the number of public parks. I’m going to run through the main ones and our favourites. Ah yes the grandma of them all, I’ll be honest I don’t know what order they were really built-in but this one feels the oldest. This is a traditional botanical garden with lots of trees, feature lakes and great sweeping lawns. This makes it great for picnics as there is plenty of space to get out the rugby ball or frisbee. Apart from the heat you could easily be in Kew Gardens. Some nice features include the jungle walk that lets you get an idea of what the jungle is like without having to trek through Bukit Timah nature reserve or round Mac Ritchie reservoir. 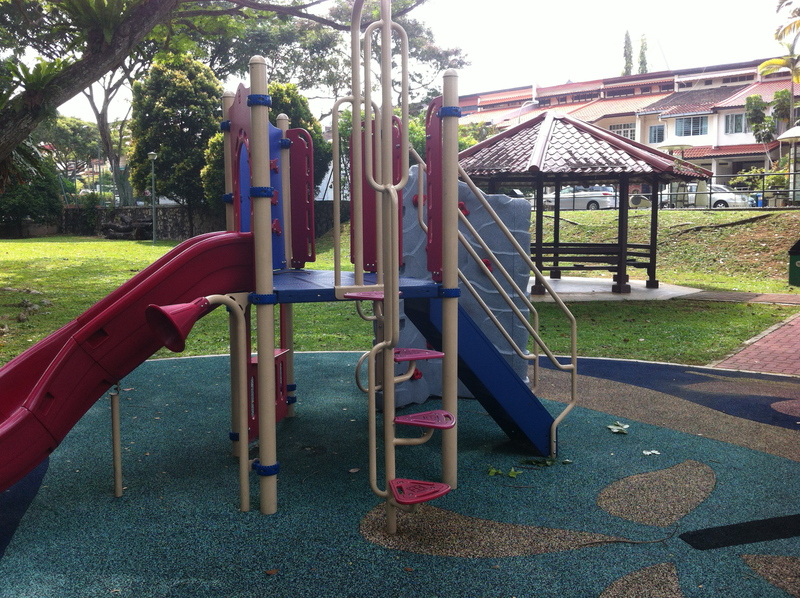 A newish children’s’ garden has been added at the Bukit Timah road end of the gardens. Lots of plants well labeled, a tree house and sandy and wet play areas. Whilst I think that a picnic is the way to go a range of food outlets from fine dinning all the way down to a food kiosk are available. Lastly but not least you can feed the fish by the Tanglin Gate but please only use the fish food that is for sale there. The longest park in Singapore running along the east coast, this really is a park where it depends on which bit you go to as they can be totally different. Really good for hiring bikes or skates and trying out cable wake boarding or sailing/windsurfing, the east coast is known for its activites. But also with a multitude of BBQ pits it’s a place for people to gather and hangout being very popular with locals and expats alike. It’s one of the few places in Singapore to go camping but you’ll need to checkout the rules. Also with some nice restaurants at Big Splash, the seafood centre with many restaurants to choose from or the hawker centre there are plenty of food options. A personal favourite used to be a beer and pub food at Scruffy Murphy’s but that whole area is under renovation currently. The only thing is you have to know where you want to go a head of time as it takes ages to walk between them. Obviously also with the beach there you can just play in the sand. Not a park that we have been too much but very different to its east coast cousin. Where as east is about enjoying the park in it’s relatively natural state, the west coast has a big playground with areas that appeal to different ages. Again a good park for picnics, the only food option that we saw was a Mc Donalds so definitely bring your own food. Camping is allowed here as well. The new kid on the block and yes it’s brash and making lots of noise. From the 2 architecturally beautiful dome greenhouses to the artificial trees with their creepers this park shouts out to you that it is there. There is a light show playing with the artificial trees every night which we only ever catch the start of as we need to get the kids home. The garden it’s self is split into different sections, one loop has culturally themed gardens the other covers the history and types of plants. The last time we were there the children’s’ garden was still under construction but the playground does look good. We have not yet been into either the flower dome or cloud forest but by all reports and looking at photos they are well worth a visit. Again this park has a number of food options but our favourite is the satay by the bay in the hawker with its low tables that are gret for kids. Otherwise there are also sit-down restaurants but not seen any kiosk style things for takeaway. Technically not part of the gardens but the barrage is just next door where kite flying is clearly the order of the day and great to watch. One look at the link of the map of park connectors will show you how this list is just scratching the surface. If your up for a long bike ride and want to stay off the roads then this is the way go to. Otherwise I think you’ll only use the ones that are near your home for a relaxing walk. For a map of the connectors click here. 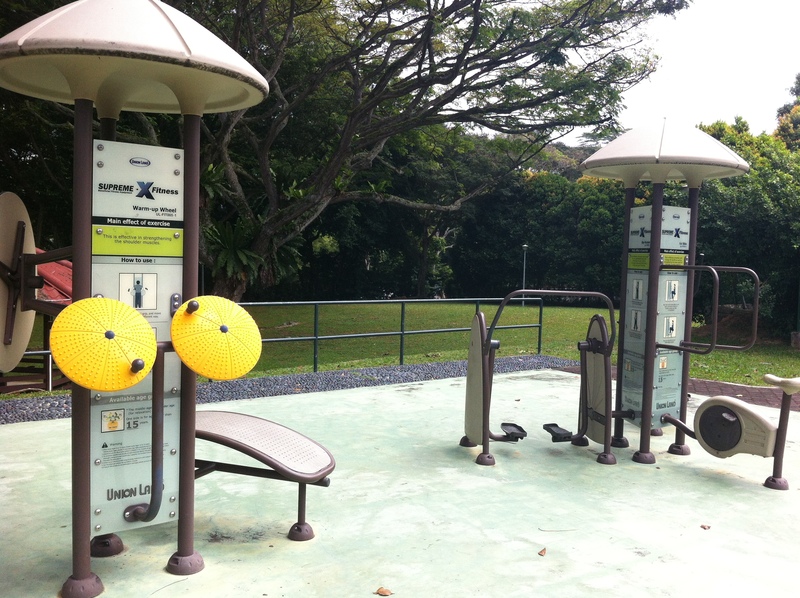 There are a bunch of other parks that we have not made it to yet such as Fort Canning, Mount Faber, Bedok Reservoir, Bukit Temah nature reserve, Mac Ritchie Reservoir, etc…. One of the things that surprised me when we moved into a house rather than a condo was the number of mini local parks that there are with playgrounds in them. 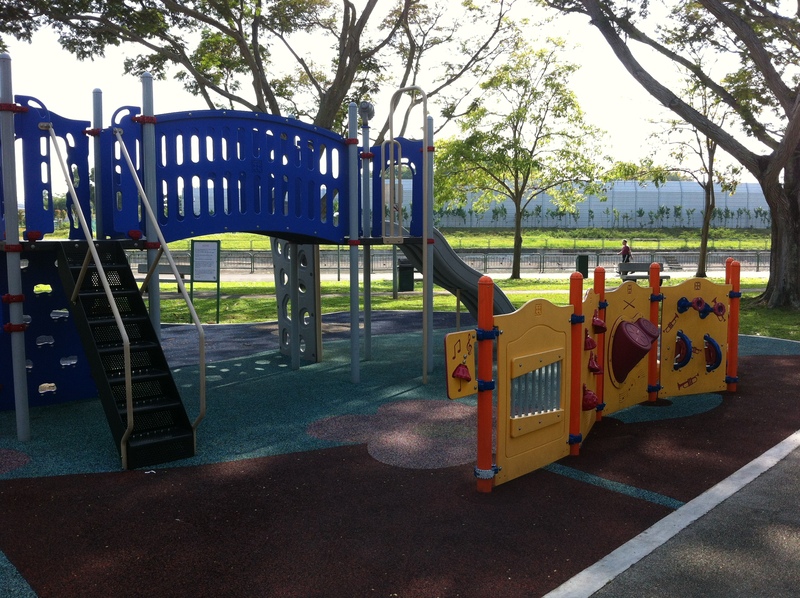 Within a very short walk of us we have our park, motorbike park, seesaw park, canal park, pirate park and piano park. Clearly these aren’t the official names that you will find in the national parks directory but are our kids names for them. As you can probably guess our park is the closest just over the road, canal is because it’s next to a canal and all the rest are named after a distinctive feature such as having the only motorbike bouncy thing (technical name for playground equipment). 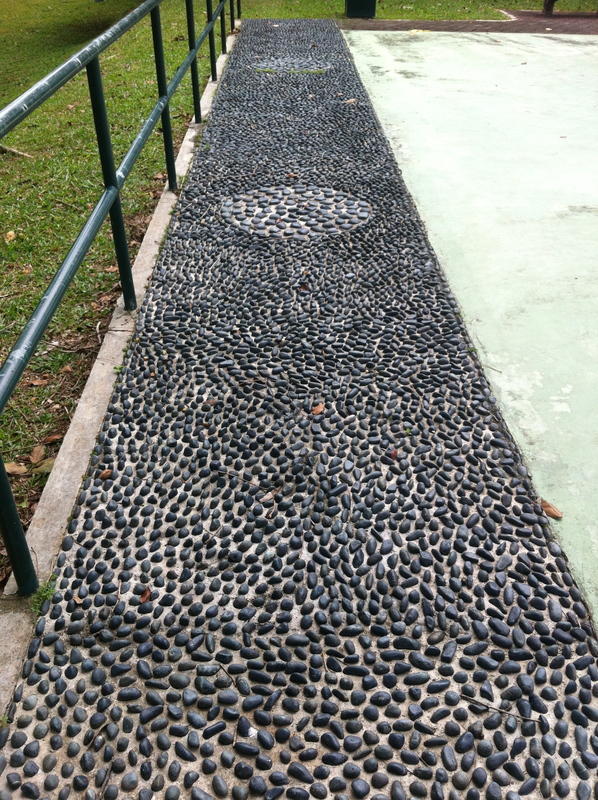 Most of these parks also have exercise areas for the elderly and also the painful but obligatory reflexology path. Can you recommend and restaurants or hawkers around there? You could get the MRT to Bishan and then it’s only two stops on the bus… There is a McDonalds in the park (this is about the only McD’s in the world I can bear to visit) and a restaurant called Grub – but I wouldn’t recommend the restaurant as it’s always impossible to get a table and they don’t take bookings. The mall at Bishan – Junction 8 – has a great food court in the bottom. You do need to go to Bishan Park. They have a natural-looking water way which is a sight for sore eyes (of course, it’s not actually natural). Grub is good but busy. We did get a table on the weekend after a wait (it wasn’t too bad as there were kids to play with that day and P spent quite some time lecturing some elderly Singaporeans who were fishing in the nearby ponds who didn’t speak English about overfishing, which was entertaining for all – but it depends heavily on everyone’s mood). But closer to the McD’s there are two other restaurants whose names I’ve forgotten and they’re less busy, and one I think is organic (?? or vegetarian? or fair trade? or something like that). Junction 8 is always good as we go there via the MRT so easy to stop in. But if you exit the park near the Clover Condo (opp McD’s) and walk a block (literally a few hundred meters to the next main road) you will also find a local hawker centre in true Singaporean style serving all the usual. I’m pretty sure there are other hawker centres within similar distance but on other sides so we haven’t ventured over. Lastly, if you go there and you find Uranus, let us know! Pingback: Free but Fun in Singapore | Free But Fun!